Capt. Ken Houtler laughed when I remarked that I didn’t know the sun rose this early as I boarded his ship last summer. Now climbing aboard again in January, I feel even more justified thinking we all should still be sleeping, because the winter sun doesn’t rise until the middle of our two-hour trip from Woods Hole around Martha’s Vineyard to our field site a few miles south of the island. 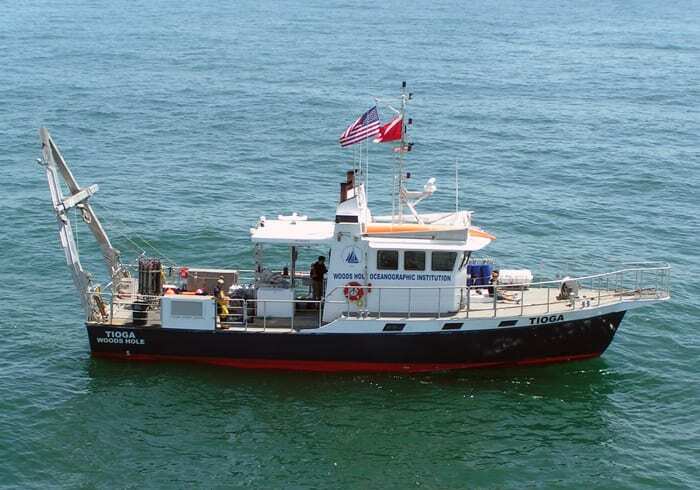 Over the ship’s speakers, Houtler blasts an instrumental version of “Hi-ho, hi-ho, it’s off to work we go” to wake us up as we pull away from the Woods Hole Oceanographic Institution dock on Tioga, WHOI’s 60-foot coastal research ship. A cup of coffee and a sunrise over the Atlantic ease me into my day. We are here to retrieve several moorings with instruments that we put in the ocean six months ago. My Ph.D. advisor Steve Lentz and I will use the information they recorded to learn how water and sand behave on the inner shelf. That’s the region of the sea that starts just past where the waves break and extends a few miles farther out. It is often overlooked as a place in between, yet that is why it is so crucial to study: Anything that moves from the beach to the open ocean or vice versa must pass through it. The larvae of fish and shellfish born in coastal estuaries are carried by currents through the inner shelf into deeper waters. Conversely, nutrients from deeper waters upwell onto the shelf to launch the ocean food chain. Oil spilled into the ocean washes ashore, and pollutants from land enter the ocean, but not without first traversing the inner shelf. Sand moves off beaches onto the inner shelf, sometimes refilling shipping channels that need to be dredged again and again. The inner shelf links each coastal ecosystem to the ocean that connects them all. As we have begun to take a closer look at what actually happens on the inner shelf, we are finding that the dynamics are complex and crucial to understand. Our field project is examining the forces that move around water, and whatever is in it, on the shallow inner shelf. Sometimes, water near the ocean surface and water near the seafloor can even move simultaneously in opposite directions. It turns out that the processes going on there are hardly straightforward, and they change with the seasons. It’s January and if it weren’t for the hardhat and orange life jacket vest, you might think I’m dressed to go sledding. But the air is still and the water is glassy smooth. 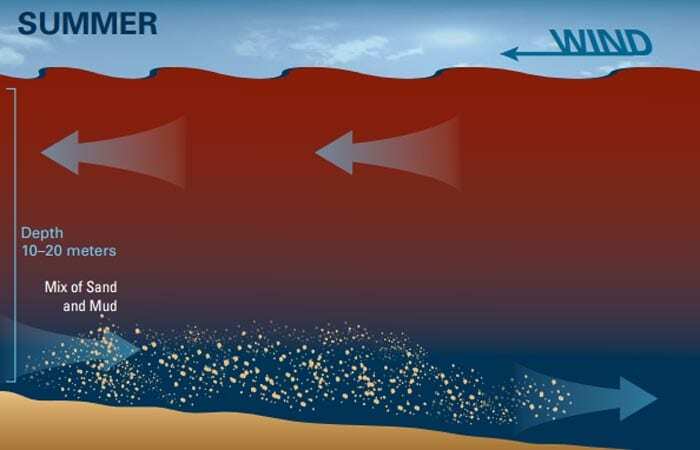 On other days, however, when winds blow surface water toward land, the water can’t just pile up on the beach, so water near the bottom has to compensate, moving offshore. If the winds blow away from the beach, the opposite happens, with water moving away from the beach near the surface and toward the beach near the bottom. In both cases, sand or sediment particles can be moved in either direction depending on how close they are to the surface or the seafloor. To investigate these dynamics, we deploy a variety of instruments. One measures the speed and direction of flowing water by reflecting sound off particles carried by the currents. The instrument also tells us the relative abundance of particles in the water. 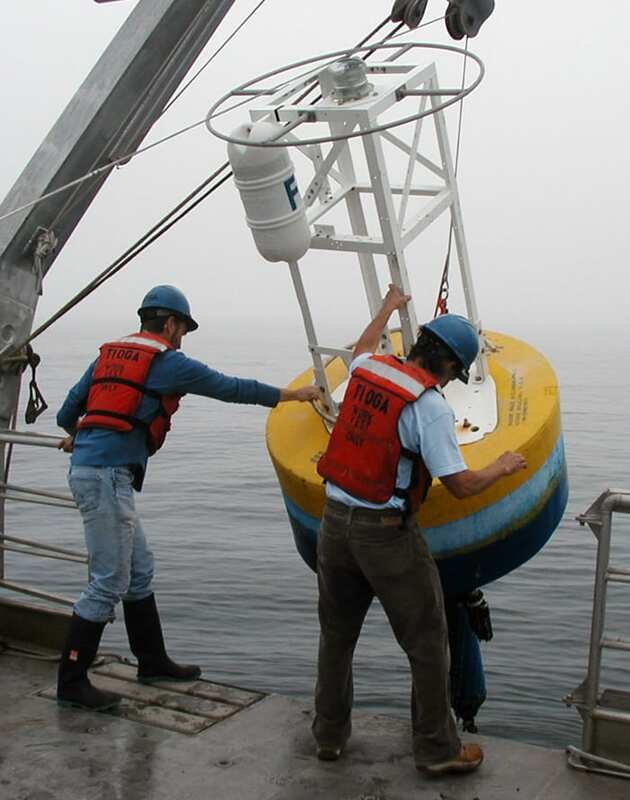 Another instrument measures water pressure, which tells us when waves pass by and when the tides go up and down. Finally, several instruments measure the temperature and saltiness of the water, which we combine to determine the water’s density. More salt makes the water denser, while warmer temperatures make it lighter. Our instruments have been collecting and recording information every 20 minutes since we dropped them off six months earlier. They were attached to four moorings, each with a buoy on top, a weight at the bottom and a dozen or so instruments fastened to 20 meters of cable suspended in between. 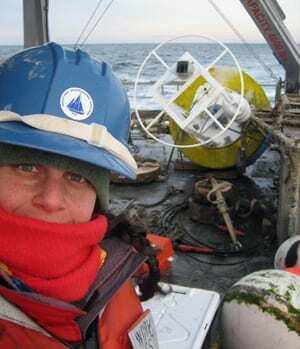 The coastal ocean is an energetic and destructive place to leave instruments for so long. In the past, storms or trawling fishing ships have made our moorings wander or disappear. Today we are happy to find all four right where we left them. First Mate Ian Hanley leans off Tioga’s back deck to snag each buoy with a hook attached to a cable. As a winch pulls the cable through a pulley on the A-frame overhead, broken mussel shells rain down on us, and I’m reminded that the coastal ocean has been called the “dirty ring around the bathtub.” Usually the phrase highlights the “ring,” the small area of the whole ocean that the coastal regions account for. But now the “dirty” part comes into play. We are getting pretty grubby, and our instruments are a mess. On each instrument, a colony of sea life has grown. Some are unrecognizable furry orange mats. Others look ready to be thrown into a clambake. Many are covered with tough, stringy hydroids and icky little shrimpy things that my running buddy, WHOI biologist Stace Beaulieu, later tells me are amphipods when I quiz her with pictures. She’s surprised at the rubbery clusters of fish eggs that remind me of the squishy kids’ toy Floam. Two black and white eyes gaze back at us from within each tiny yellow ball. Figuring out just how all those mussel and barnacle larvae get moved around so they can settle on our instruments is a fascinating part of the research, but my piece of the puzzle focuses on the real dirt on the sea floor—the sand and mud. To predict where sand and mud will be transported across the inner shelf, you first need to know how high into the ocean they are lifted when waves and currents sweep them up off the seabed. My original plan was to collect bottles of seawater from various depths before we removed the other instruments from the water. 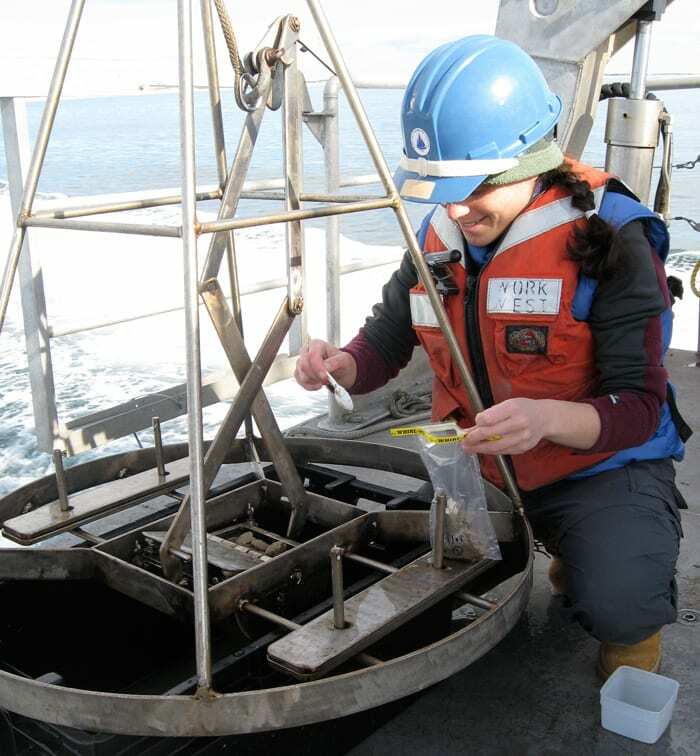 Measuring the sediment particles in the water samples, I would ground-truth these data against data on particles measured acoustically with our instruments. But fieldwork rarely goes exactly as planned. On my first trip on Tioga, I dutifully collected 80 liters of water, noting they looked remarkably clear, and lugged them back to the lab. A few weeks later, I had a chance to filter the first batch. I started with the bottles I thought would have the most sediment, but it only took me three liters to realize, with dismay, that there wasn’t any sediment in any of them—not a single sand grain and no mud measureable above the background of biological fluff drifting through the water. It turns out that days that are calm enough for safe research aboard Tioga are also too calm to lift sediment far off the seafloor. But the research must go on! Samples from the seafloor would have to provide my only clues as to what kinds of sediment might be in the water above it. Using the same winch that hauled up our moorings, we lower a grab sampler, an underwater claw of sorts, to scoop samples of the sand and mud. The particles’ size affects how high in the water the particles will go. But a critical factor turns out to be density differences of the seawater above the seafloor. Warm water is less dense than cold water and fresher water is less dense than saltier water, and conditions vary from place to place and season to season. In winter, frigid air cools water on the surface, making it denser. It sinks, mixing all the water below it on the way down. Storm winds also do lots of mixing so that all of the water is the same temperature. In winter, the inner shelf region is one big, thick, cold layer from top to bottom, so sand and mud can mix throughout the whole water depth, all the way to the surface, and can potentially be carried horizontally for longer distances. In summer, warm air and sunshine heat up the surface water, creating a layer of warmer, less dense water that stays above colder, denser water below. This layering makes it harder for water from the surface and bottom to mix; sand and mud can be trapped in the lower layer of water. This trapping or capping of sediment is a common phenomenon near estuaries and river mouths, which add a surface layer of fresh water that is much less dense than the salty bottom water. These subtle density differences ultimately determine the thickness of the bottom layer of water and how hard or easy it is for sand and mud from the bottom to rise higher into the ocean and be transported farther horizontally. This phenomenon has not been well measured on the inner shelf. Our measurements off Martha’s Vineyard are some of the first to show that this capping effect has significant ramifications on the inner shelf and should not be discounted when scientists calculate how sediment is transported. The physics we learn about near Martha’s Vineyard will apply to the inner shelf on many coastlines. The data we bring home today will keep me busy for the next six months. Away from the sea spray, I’ll tease apart the effects of wind and waves and sun on the movement of water and sand and mud. Part of why I like working in coastal regions is that the processes I study here are very tangible. They happen in meters to kilometers and minutes to days—on human scales. We study the inner shelf to understand the natural forces that ultimately shape the coastline we all know and love from taking walks on the beach, swims out past the breakers, or fishing from a pier or a dinghy. That a few days of fieldwork each year can support so much research is a testament to both the sheer volume of information our instruments collect and the complexity of coastal processes. We finish around sunset, a much more familiar sight for me, but I barely notice as we hurry to strap down all the gear before steaming home in the darkness. 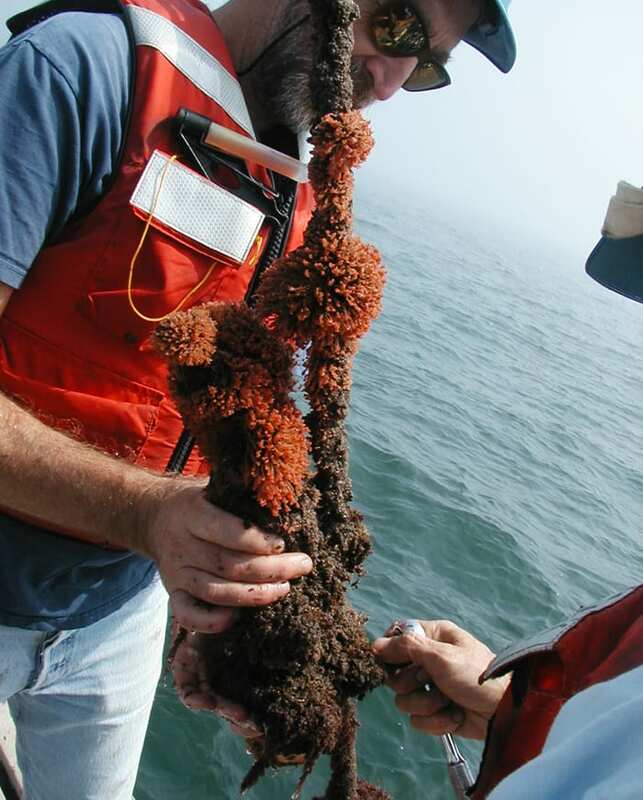 This research was funded primarily by the National Science Foundation, with additional support from the Coastal Ocean Institute at WHOI. Anything traveling from the shoreline to the ocean and vice versa—water, fish larvae, sand, pollutants—must go through the shallow inner shelf, which connects the beach to the deep ocean. There’s a whole lot of physics going on there. Take sand, for instance. As waves and tides moveback and forth, they can stir up sand and sediments in the shallow inner shelf region. That can lift particles into the water, where they can be transported horizontally by currents. How far and in which direction the sand will travel depends on several factors, including how high they are lifted, which can change with the season. Warm water is less dense than cold water and fresher water is less dense than saltier water. In winter, frigid air cools water on the surface, making it denser. It sinks, mixing all the water below it on the way down. Winter storm winds also do lots of mixing so all of the water is the same temperature from top to bottom. With the ocean comprised of one big, thick, cold layer, sand and mud can mix throughout the whole water depth, all the way to the surface, and can potentially be carried a longer distance horizontally. In summer, warm air and sunshine heat up the surface water, creating a layer of warmer, less dense water that stays above colder, denser water below. This layering makes it harder for water from the surface and bottom to mix; sand and mud can be trapped in the lower layer of water. Recent research has shown that this capping effect has significant implications and should not be overlooked when scientists try to predict the movement of materials through the inner shelf regions.